The hedgehog (Hh) signaling pathway regulates many processes of development and tissue homeostasis. Activation of hedgehog signaling has been reported in about 30% of human cancer including ovarian cancer. Inhibition of hedgehog signaling has been pursued as an effective strategy for cancer treatment including an ongoing phase II clinical trial in ovarian cancer. However, the rate of hedgehog signaling activation in ovarian cancer was reported differently by different groups. To predict the successful for future clinical trials of hedgehog signaling inhibitors in ovarian cancer, we assessed hedgehog pathway activation in 34 ovarian epithelial tumor specimens through analyses of target gene expression by in-situ hybridization, immunohistochemistry, RT-PCR and real-time PCR. In contrast to previous reports, we only detected a small proportion of ovarian cancers with hedgehog target gene expression, suggesting that identification of the tumors with activated hedgehog signaling activation will facilitate chemotherapy with hedgehog signaling inhibitors. Ovarian cancer is the most deadly type of gynecological cancers. Epithelial ovarian cancer is the major ovarian malignancy consisting of five histological subtypes: serous, mucinous, endometrioid, transitional and clear cell [1, 2]. Overall, the 5-year relative survival of ovarian cancer patients is 46%. If diagnosed at the localized stage, the 5-year survival rate is 93% . The survival of ovarian carcinoma patients has not improved significantly for years due to lack of knowledge for molecular mechanisms underlying ovarian cancer development. Thus, identifying novel markers for early diagnosis of ovarian cancer can significantly reduce the mortality of ovarian cancer and possibly facilitates targeted cancer therapeutics. The hedgehog (Hh) signaling pathway regulates many processes of development and tissue homeostasis [4, 5]. In the absence of the ligand Hh, hedgehog receptor (PTCH1 or PTCH2) inhibits smoothened (SMO) signaling. When Hh binds to PTCH1, SMO is able to signal, eventually resulting in formation of activated transcriptional factor Gli (Gli1 and Gli2) molecules and elevated expression of the target genes (e.g. PTCH1, Gli1, HIP etc). Activation of hedgehog signaling has been reported in about 30% of human cancer  including ovarian cancer. Inhibition of hedgehog signaling has been pursued as an effective strategy for cancer treatment including an ongoing clinical trial in solid tumors  such as ovarian cancer. Previous studies showed different results of hedgehog signaling activation in ovarian cancer. While one study suggests activation of hedgehog signaling in virtually all tumors examined using mainly immunohistochemistry , another study indicated a much low rate of hedgehog signaling activation . It appears that a comprehensive study on ovarian cancer hedgehog signaling is necessary in order to predict the feasibility of clinical trials of hedgehog signaling inhibitors in ovarian cancer. In this study, we examined hedgehog pathway activation in 34 ovarian cancer specimens through analyses of target gene expression by in-situ hybridization, immunohistochemistry, RT-PCR and real-time PCR (Additional file 1). Previous studies indicated that sonic hedgehog expression is elevated in ovarian cancer [1, 8–10]. These and other studies led to a phase II clinical studies in ovarian cancer using hedgehog inhibitors. We examined three hedgehog target genes in these specimens: PTCH1, Gli1, HIP1. Tumors with expression of two hedgehog target genes are regarded as hedgehog signaling activated tumors. PTCH1 expression was detected in 9 of 34 (~26%). In in-situ hybridization analysis, most positive staining of PTCH1 was seen in the cancer tissues (Figure 1 indicated by arrows) not in the adjacent stroma. The antisense probe of PTCH1 gave positive (blue) signal but the sense probes did not show staining, indicating the specificity of in-situ hybridization. Further analysis did not reveal association between PTCH1 expression and tumor subtypes, stage or other characteristics (Additional file 2). The result of in-situ hybridization was confirmed in tumor specimens with 70% of tissue mass by PCR amplification (Figure 2). Expression of PTCH1 protein (Figure 3) was further confirmed by immunohistochemistry in the specimens with elevated expression of PTCH1 transcript. 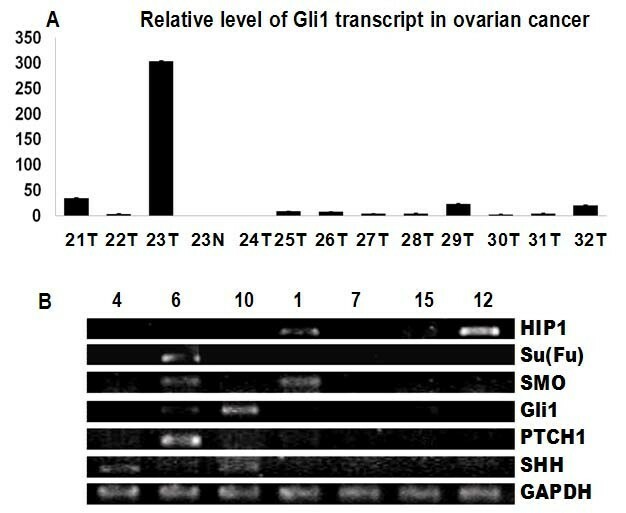 Expression of PTCH1, GLI1 and HIP1 in ovarian cancer. PTCH1, GLI1 and HIP transcript (blue as positive) was detected by in situ hybridization in a well-differentiated serous papillary adenocarcinoma (the left panel), and the right panel pictures are their controls with respective sense probes (Bars indicate 50 μm). PCR detection of hedgehog signaling in ovarian cancer specimens. A. Real-time PCR analysis of GLI1 expression in ovarian cancer was performed as described in Materials and Methods. Gli1 transcript was shown here. B. PCR detection of SHH, PTCH1, GLI1, SMO, HIP1 and Su(Fu) transcripts in ovarian cancers. GAPDH is the endogenous control. Numbers listed indicate specimen number. 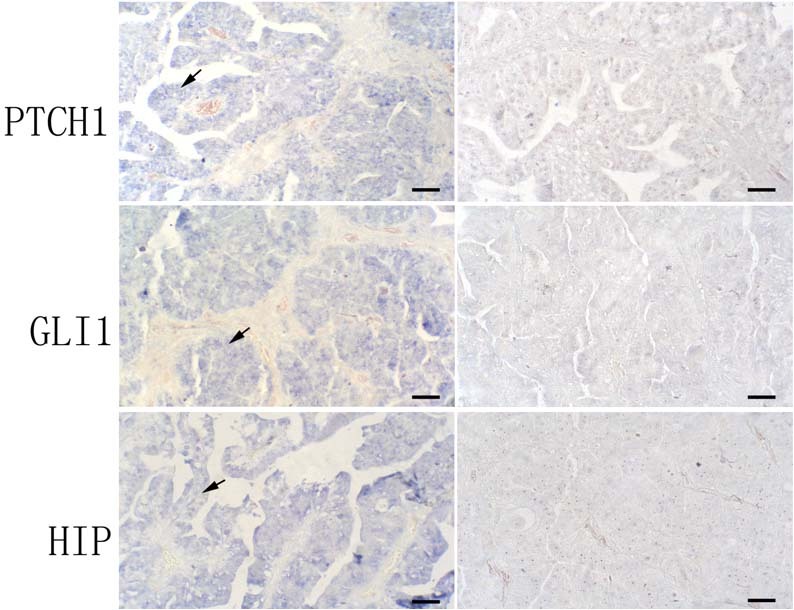 Expression of PTCH1, SHH and SMO protein in ovarian cancer. PTCH1, SHH and SMO protein (yellow as positive) was detected by immunohistochemistry in a poorly-differentiated serous papillary adenocarcinoma (left panel), and the right panel pictures are controls without primary antibody (Bars indicate 50 μm). GLI1 and HIP1 expression was detected in 9 of 34 (~26%) and 7 of 34 (~21%) cancers respectively. Like PTCH1, most positive staining of GLI1 and HIP1 was shown in cancer (Fig. 1 indicated by arrows), not in stromal tissues. Real-time PCR confirmed the results from in-situ hybridization showed that normal tissues had low or no level of GLI1 expression whereas tumor tissues had elevated levels of GLI1 (Figure 2). Like PTCH1, we did not find association of Gli1 expression (or HIP1) with any tumor characteristics. The result of RT-PCR shown in Figure 2 was consistent with result of in-situ hybridization. Further analysis indicated that PTCH1 co-expressed with GLI1 (p = 0.0033), but not with HIP1 expression. HIP1 expression was only detected in 2 specimens which expressed PTCH1 or Gli1, indicating that HIP1 is not highly expressed in ovarian tissues or is silenced in cancers as reported in other studies [11, 12]. Only 7 out of 34 ovarian cancer specimens (~21%) have elevated expression of two hedgehog target genes (Additional file 2), indicating that hedgehog signaling activation is not very common in ovarian cancer. To understand the molecular basis of hedgehog signaling activation in ovarian cancer specimens, we assessed expression of hedgehog signaling components in ovarian cancer. Expression of SHH was found in 11 of 34 (~32%) ovarian cancers (Additional file 2). By in-situ hybridization, we found SHH expression mainly in cancer tissues (Figure 4 indicated by arrows). PCR also showed that normal tissues had low or no level of SHH expression, while tumor tissues had elevated RNA level of SHH (Figure 2). Further analysis revealed that SHH did not co-express with hedgehog target genes PTCH1, GLI1 or HIP. SHH expression was not associated with expression of hedgehog target genes (Additional file 2), indicating that SHH expression alone is not responsible for Hh pathway signaling activation in ovarian cancer. 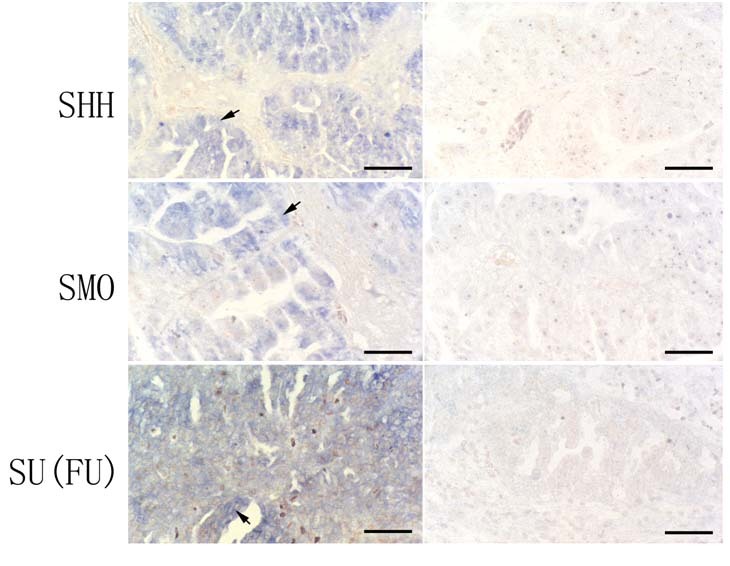 Expression of SHH , SMO and Su(Fu) in ovarian cancer. SHH, SMO and Su(Fu) transcript (blue as positive) was detected by in situ hybridization. The positive stain of SHH, SMO was shown in a well-differentiated serous papillary adenocarcinoma and the positive stain of Su(Fu) was shown in a poorly-differentiated serous papillary adenocarcinoma (left panel), and the right panel pictures are controls of in situ hybridization with respective sense probe (the bar indicates 50 μm). In addition to SHH, we also detected expression of SMO and Su(Fu) in 17 ovarian cancers. Although we found SMO expression in 4 (~24%), and Su(Fu) in 4 (~24%) tumors respectively. Most tumors with elevated expression of Gli1 and PTCH1 had no expression of SMO, suggesting that SMO expression was not responsible for hedgehog signaling activation in ovarian cancer. The result of in situ hybridization was confirmed by semi-quantified RT-PCR showing in Figure 2. Expression of SHH and SMO protein (Figure 3) was also detected by immunohistochemistry in the specimens with expression of SHH and SMO by in-situ hybridization and RT-PCR. In summary of our data, we found only a small proportion of ovarian cancer specimens with elevated hedgehog signaling activation. Our data also showed that elevated SHH expression is not always associated with Hh target genes expression. Based on our data, we caution that clinical trials with hedgehog signaling inhibitors in ovarian cancer may be successful in selected patient population with elevated Hh target genes. Using several approaches, we showed that the percentage of hedgehog signaling activation is low in ovarian cancer. We only found 20% of tumor specimens with detectable expression of two hedgehog target genes, as indicated in real-time PCR and in-situ hybridization analyses. Our data suggest that it is necessary to identify the right population of ovarian cancer patients in the clinical trials with hedgehog signaling inhibitors. In addition, we found that even in the tumor with elevated expression of hedgehog target genes Gli1 and PTCH1, expression of SHH is not necessarily high, suggesting other mechanisms of hedgehog signaling activation in the cancer. The fact that hedgehog signaling activation is not associated with any particular subtypes of ovarian cancer suggests that the morphological classification of ovarian cancer may not reflect the molecular pathogenesis of this disease. It will be of interests to establish an animal model to study hedgehog signaling-mediated carcinogenesis in ovary. Different results have been reported on hedgehog signaling activation in ovarian cancer [8, 9]. There are several reasons for this discrepancy. First, different standards have been used to define Hh signaling activation in ovarian cancer. 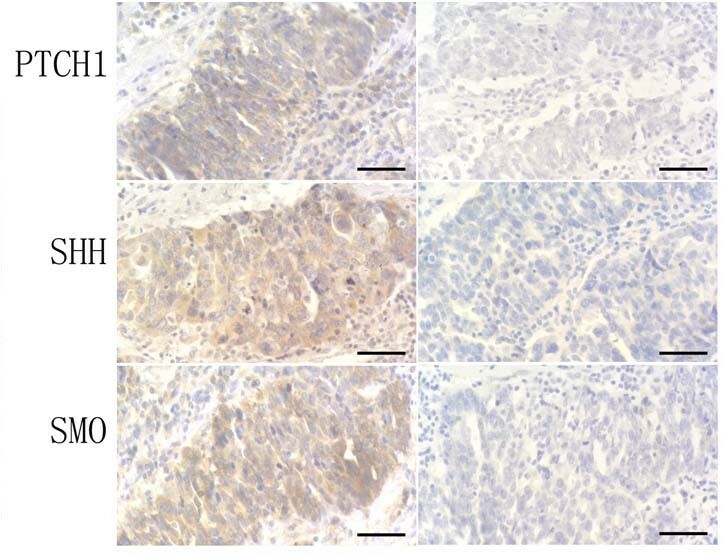 One group used immunohistochemistry to detect expression Hh targets PTCH1 and Gli1 in the tumor specimens  whereas we and others assessed the expression of Hh target genes by several methods: in-situ hybridization, real-time PCR and immunohistochemistry. Although it is possible that our results may under estimate the frequency of hedgehog signaling, we predict that screening of Hh signaling activated tumors will significantly improve the successful rate of clinical trials using Hh signaling inhibitors. It is also possible that the involvement of Hh signaling in human cancers may be context dependent, occurring in some tissues or cell lines but not in others. Evidence suggests that Hh signaling may be involved in maintaining cancer stem cell proliferation [13, 14]. Taken together, our findings suggest that activation of the Hh pathway is not frequent in ovarian cancer. The fact that SHH expression is not correlated with Hh target gene expression suggests that there are other mechanisms responsible for Hh pathway activation. Our studies predict that targeted inhibition of the hedgehog pathway may be only effective in a small percentage of ovarian cancer patients. Dr JX is a professor at Indiana University Wells Center for Pediatric Research and IU Simon Cancer Center, with a focus on hedgehog signaling in human cancer. He was involved in the initial linking of hedgehog signaling to human cancer in 1996 and was the first to report activated SMO mutations in human cancer. Professor HZ from Shandong University has expertise in developmental biology and interests in linking developmental pathways to human diseases. In the last few years, these two groups have reported links of hedgehog signaling to several cancer types, including liver, esophageal, colon and gastric cancers using comprehensive analyses of hedgehog target gene expression. This work was supported by the National Cancer Institute (CA94160 to JX), Wells Center for Pediatric Foundation (JX), IU Simon Cancer Center (JX), the National Natural Science Foundation of China (30671072 and 30570967) and the Ministry of Science and Technology of China (2007CB947100 and 2007CB815800) to ZHW. LY carried out the in-situ hybridization and immunohistochemistry, performed the statistical analysis and drafted the manuscript. SH and YB participated the in-situ hybridization and immunohistochemistry. JH, XZ and NH performed the real-time PCR analysis of ovarian cancer. JX and HZ designed and planed the experiment, drafted the manuscript. All authors read and approved the final manuscript.